The first suggestion or reference to the proposed School of Business Administration in a public document seems to be in a report entitled “Postwar Public Works Program for the University of Michigan,” dated October 1, 1943. A building for the School of Business Administration appeared as Project 23 in this report, with a suggested expenditure of $600,000. The first money appropriated by the state for the building was $1,800,000, approved by Governor Kelly on February 18, 1946. 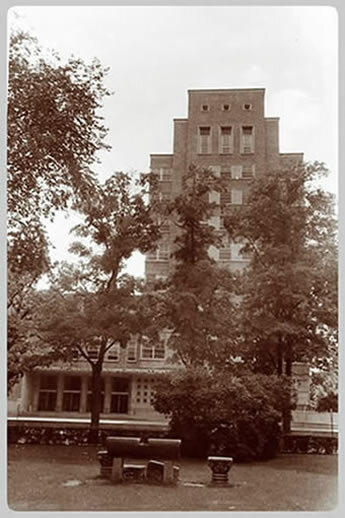 The site, authorized by the Regents in July, 1945, was in the block surrounded by Monroe, Tappan, Hill, and Haven streets and was purchased at the time construction was begun, the building occupying approximately the north half of the block. Ten private dwellings were removed for its construction, which began in August, 1946. 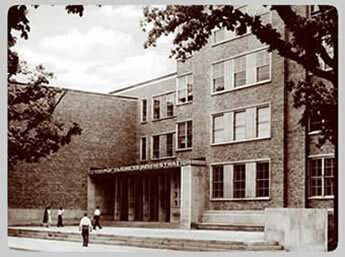 Money to complete the building was appropriated in 1947. 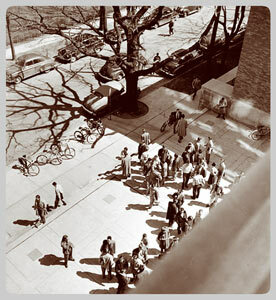 The south wing, the library, and the administrative offices were occupied in the fall of 1948, and the remainder of the building in February, 1949. Lee and Kenneth C. Black, of Lansing, Michigan, were the architects. The latter was chiefly responsible, and this building was his first on the Michigan campus. Since its construction, however, he has served as architect for the Alice Lloyd Radiation Therapy Laboratory, for alterations to the Neuropsychiatric Institute and the University Hospital, and for the Women's Swimming Pool. The total cost was $2,715,000, including $299,000 for land and land improvements plus $95,000 for furniture and equipment. The School of Business Administration Building contained 1,811,000 cubic feet, and consisted of a classroom and laboratory wing on the south, a library and lecture wing on the east, and an office tower on the northwest corner. 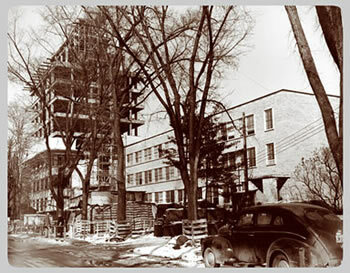 The structural framework was of reinforced concrete to the fourth-floor level, above which the faculty office tower was of structural steel construction. The exterior was of brick with double-hung aluminum windows. The library seated 380 students and had stack space for 100,000 volumes. There were thirty class, laboratory, and lecture rooms, with seating capacity ranging from seventeen for small seminar rooms to 192 for the two largest lecture rooms. The standard classroom, of which there were thirteen, seated forty-nine students. Five lecture rooms, the smallest seating eighty-two, were constructed without windows in order to facilitate the use of visual education programs. One of the two student lounges was equipped with a kitchenette, and a faculty lounge on the ninth floor of the tower was similarly equipped. All classrooms, laboratories, and lecture rooms were equipped with strip tables of metal or wood which were permanently fastened to the floor. Chairs were metal and movable. Two of the laboratories had underfloor ducts for electrical outlets so that automatic business machines could be plugged in at any desired location. All classrooms and lecture rooms were provided with recesses equipped with rods, coat hangers, and racks for hats and books. Furnishings in the principal student lounge were provided by student contributions and earnings from activities of the student council. Furnishings for the faculty lounge were provided by subscriptions by faculty and alumni of the School. 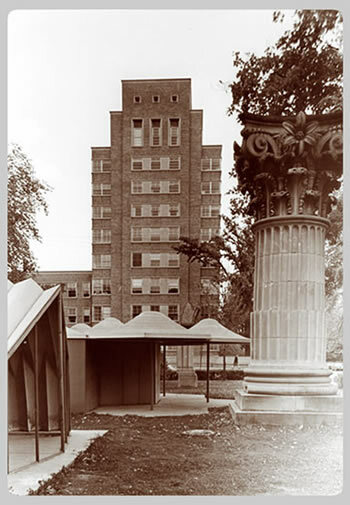 Although the building was used primarily by the School of Business Administration, parts of it were made available for classes to the School of Education, the College of Literature, Science, and the Arts, and the Extension Service.